To build and grow your business on social media you have to consistently publish content (and lots of it) to the different social platforms where you engage your audience. But, you can’t just haphazardly publish content – at least not if you want to get results – you need a plan. And that’s where a social media calendar comes into play. A social media calendar as the name suggests is a calendar for managing, organizing and scheduling your social content, but more than that, it’s a tool that enables you to have a strategic approach to content publishing. And to get results with social media marketing, you need a strategic approach! So, if you’re not already using a social media marketing calendar then it’s time to start, and in this post, you will learn how to plan one and put it together, you will also learn about the different types of calendars you can use. If your ready let’s get started. Before we get into the meat and bones of this post, I want to highlight some of the benefits of using a calendar to manage your social content and scheduling. Get More Done – Because you plan content in advance, you don’t need to waste time every day wondering what to publish and looking for content sources, which means you can spend that time focusing on other areas of your business. More Business Value – When you plan ahead, you put more thought into what you are publishing and why. It allows you to align your content with the business goals you want to achieve through your social media marketing. Team Efficiency – If other teams members help with content it keeps everyone on track, they know ahead of time what content they need to create or curate. Now, that you understand the importance of creating a social media calendar and the benefits it brings, let’s dive into how to plan one. There are lots of different social media platforms, but you don’t need to be on all them. You should only focus your energies and efforts on the platforms where your audience is hanging out. For example, if your target audience consists mainly of people between the ages of 40 to 60, then there is no point in building a presence on Snapchat where the majority of users are 18 to 24. Likewise, if your audience is predominantly male, then Pinterest is not a good channel because 81% of users are female. 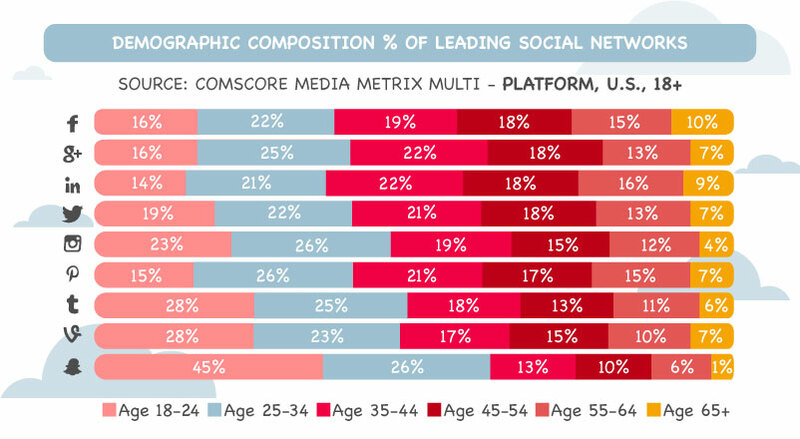 The below image provides some insights into the demographic make-up and purpose of the some of the major platforms. Once you know which platforms you will focus on, you can begin planning the content for each. In addition to different formats, you will also need a mix of different types of content for each platform – inspirational, educational, entertaining, promotional – this helps keep your audience engaged. Again, depending on the platform, you will need to adjust the mix of content types – pictures of cats won’t work well on Linkedin, whereas those same images would probably go down a storm on Instagram. The next step in planning your calendar is setting a publishing schedule for how often you will post on each channel. Below you can see the recommend posting frequency for the major social networks. In addition to how often you post you will also have to schedule the times, you publish to each channel. There are lots of options out there for setting up a successful social media content calendar – and in this post, we’re going to explore several types and how to set up a successful calendar of your own. To easiest way to design and create a calendar is with a spreadsheet like Excel or Google Sheets. You can include more columns if necessary like a column for author name and post-objective. Regardless of how detailed or simple you make your calendar, the main thing is that you can track and plan your content and publishing schedule for a month. If you’ve got (or you’re building out) a more robust content process, with more social media managers, SEO specialists, content writers, etc., then a Trello board or another planner board might work best for you. With a board, you can organize lots of different types of content and share the board with other people on your team so that everyone involved in your content process is on the same page. Before we dive deeper into this type of social media calendar, let’s take a look at a typical content creation process. Ideas/keywords: The marketing team decides which content needs to be written, sometimes this is focused on keywords to improve SERP ranking (blogs, ebooks, newsletters, press releases, etc.). Backlog: The content manager or editor will create titles and content briefs for the writers to write up as blog posts, ebooks, and other forms of content. Once something is moved from ideas/keyword to backlog, it’s ready to be written by a writer. Editing: The editor is editing the content and preparing to schedule it to go live on your website, landing page, or in your email platform. Scheduled: This means a post is ready to go and is set up in your company’s CMS to post to your website. In this example, you can see there are many writers tagged on different cards. Each card represents a piece of content. And each bucket/column represents a type of content (guest post, blog post, premium). With this board, you can see how the columns progress in the same way that content is typically produced – moving from idea to draft and then editing and finally, publishing. Or, you could add columns for each platform your company is on, Facebook Scheduled, Instagram Scheduled, etc. Note* If you don’t want to have your social media calendar on the same planner as your company’s content calendar (for fear of it getting too overwhelming), simply set up another Trello board for social. Create columns for each channel, or however you’d like to organize it. It’s great for marketing, writers, editors, and social media teams to be on the same page about what’s coming down the pipeline content-wise. You’re probably familiar with the way that social media automation tools work: You pre-schedule posts into a software app that can send your posts to multiple social media channels. Most of the automation tools out there also offer a calendar view of your social posts that you’ve queued up to publish. For example, with Tailor Social, you can view a month’s schedule and see which posts are going out. It’s also interactive – so you can drag and drop posts into new time slots or days, etc. Now that you’ve learned the ropes of what goes into creating a social calendar, we’re going to give you a few pointers for how to make the most of your scheduling. Each social platform has a set of analytics that you can access to learn more about how your users are reacting to your content. After a while, you’ll start to notice patterns in this data. For example, you might notice that your users are more active and engaged during the afternoons on weekdays. Whatever your findings – optimize your posting schedule so that you’re posting when your users are most active. If your analytics show that your latest post about your new blog did really well – then reshare that post! You might rewrite the copy that comes before the post, but it’s always effective to give your users more of what they like. You can safely reshare a post several times in a month without exhausting your audience. To play it safe, just reshare popular posts once a week for a month or so. Each audience is different, so you might try different numbers of re-shares before you settle on a number that works best for your brand. This also makes your scheduling much easier as you’ve got a handful of posts with minimal effort. There’s a lot that goes into creating an effective social media calendar – but at the end of the day – it’s got to be what works best for your business. Stick to a spreadsheet if you’re a small team and want to keep things as simple as possible. If you’re a larger team, you might need to use a planner, like Trello, to keep track of all the types of content in your pipeline. And if you’ve got the budget and are looking to automate – then an automated calendar can save you lots of time. What’s the most effective thing about your social media calendar? Share your thoughts with us in the comments. We’d love to hear from you!